Although YouTube is the most popular video website, many businesses choose Vimeo because it offers more exclusive and private video hosting options. Instead of hosting your video on your own web server, an increasingly popular alternative is to upload video files to YouTube, Vimeo, or another video hosting site and then include special code from that site in the HTML code of your web pages. The video plays within your pages, even though it’s not hosted on your web server. Adding video from a site like YouTube to your pages is easier and often works better than inserting video directly into your site. The many video hosting sites today range from expensive high-end services, such as BrightCove and Akamai, which handle big video clients like The New York Times and Showtime to free services, like YouTube. WARNING: YouTube is a great option if you want your video to reach the widest audience (for free) but when you upload a video to YouTube, you give up some of your rights to your video in exchange for having it hosted on the site. Similarly, when you add a video to your site from YouTube, you’re stuck with the YouTube player, which includes the YouTube logo, as well as ads that might be shown on top of, or next to, your video. Make sure to read through the terms and conditions on any video site you use so that you fully understand the rights (to your own video) you may be giving away and how the site may use your video in the future. Today YouTube and Vimeo seem to offer the best options for most small- to medium-sized websites, but new competitors are emerging. The services that these video companies offer keep changing, so you may want to research the best services for your videos needs before you decide where to host your videos. * Better Video Compression: Both YouTube and Vimeo optimize video for you when you upload it to their servers, and they often to a better job than you could yourself. * Deliver the right version to each visitor: YouTube detects the connection speed and device of your visitors and delivers video accordingly. If you visit YouTube with an iPhone, you see the video in MP4 format. View the same video with a computer, and you see the Flash version. Similarly, if you have a fast 3G connection, you see a higher-resolution version. View the video with a slower connection, and you see a lower-quality version that loads faster. * Manage bandwidth costs: These services can also help you save money. If your videos become popular and you host your own video, you may exceed the bandwidth limits of your web host and incur additional fees. Because video uses more bandwidth than other types of content, overages can get costly. Hosting your video on YouTube or Vimeo means you’ll never be surprised by extra bandwidth fees for video. When you paste code from Vimeo or YouTube into Dreamweaver, make sure you paste the code into the HTML code using Code View or Split View (shown here). 1. Create an account on the site by filling out a form (or log into your account if you already have one). If you want to use the professional-level services on Vimeo, you also must pay a fee. 2. Upload your files to the site through your web browser. In this process, the video is uploaded and encoded, which can take a few minutes depending on the site and how busy it is. 3. 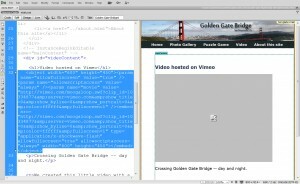 Follow the site’s instructions for copying the code you need to embed your video on your website. 4. Open your web page in Dreamweaver, and paste the code snippet into the HTML code on your page, in the place you want the video to appear.